This is where we're going this coming week: http://www.paipiranhafishingpark.paiexplorer.com/index.html ...very rustic and cute little fishing lodge in Northern Thailand. It doesn't have the monster catfish we've been catching at BoSang Fishing Park but there's a nice variety of species and we hope to catch several different kinds of fish. How about good basic double occupancy accommodations for 1 day/night, fishing available 24 hours, all for about $30.00US per COUPLE? 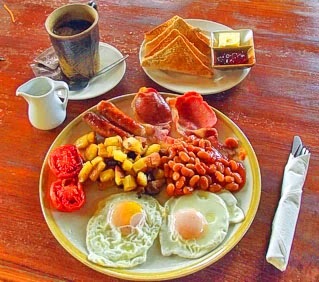 Unfortunately the great breakfast you see pictured here is extra but so it should be!